Remember every branch of the family with Annie Howe's charming, personalized papercut. 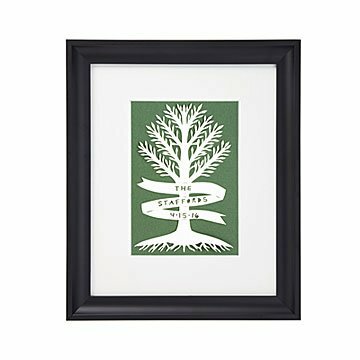 Remember your roots and every branch of the family with Annie Howe's charming papercut, personalized with your clan's name, special dates, or any desired personalization (up to 40 characters) hand cut into the design. Beautifully framed, it's an instant heirloom and memorable gift for an anniversary or family reunion. Laser-cut design with hand-cut personalization. Handmade in Baltimore. This is a made-to-order item. If you order today your item will ship no later than 5/17/2019.